Home » IYIM NEWS AND EVENTS » Encouraging Today’s Rabbis to Create Halakhic Solutions! The New York based newspaper, the Jewish Press, published in their weekend edition an article about International Agunah Day authored by the director of the IYIM Agunah and Get-Refusal Prevention Project, Dr. Rachel Levmore. 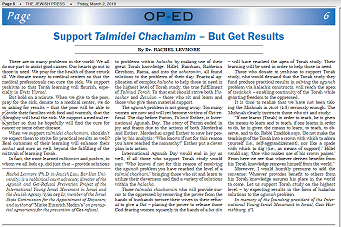 With its title “Support Talmidei Chachamim — But Get Results”, Dr. Levmore, in a novel approach, called upon all who donate money to yeshivot, who are benefactors and support Torah study, to expect practical results from those benefiting from their support, in the form of solutions to the agunah problem within halakhic constructs. The article was dedicated to the memory of the founding president of the International Young Israel Movement in Israel, Ceec Harrishburg, z”l.